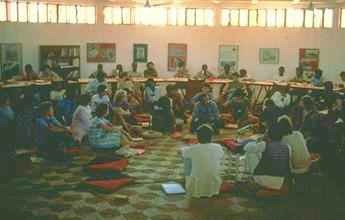 Organization and collective decision making has been one of the most challenging aspects of Auroville's growth. Over two decades, numerous systems and revisions have evolved. In the early years when the population was small and issues mainly involved survival and basic maintenance, decision making was more spontaneous and decentralized, responding directly to need rather than acting through more formal processes. As Auroville has grown larger and more complex, it has tried to maintain this original spirit of responding to real needs, adapting its organization to changes in individual and collective growth rather than succumbing to bureaucratic forms and habits. Presently, an Auroville Council serves as a focal body for administrative and executive issues; a general assembly represents the community at large, meeting as needed to discuss and confirm decisions that affect the collective; and decentralized work groups address issues such as education, farming, and business.